Melt the coconut oil over medium heat in a medium-sized saucepan. Slowly combine the cacao powder, maple syrup, and vanilla extract. Stir well. 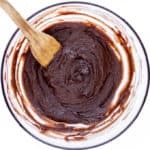 When the mixture has the texture of melted dark chocolate, add in the baked sweet potato and stir energetically, or use a hand-mixer. Let sit 5 minutes before spreading the chocolate frosting on the cake. * Bake your sweet potatoes in advance, skin on, in the oven at 350F for about 45 minutes to an hour. You can tell they are ready when you can poke them through with a fork.